I blame True Blood for getting me into The Vampire Diaries. My boyfriend needed a vampire fix in between the all too short seasons of True Blood, so we decided to add The Vampire Diaries to our watchlist. Though I carefully sidestepped the Twilight movies and have managed to avoid any amount of novels starring werewolves and vampires, I have ended up following ‘Dawson’s Creek with Fangs’, as some might call it. It is based on a series of books by L.J. Smith, which I will never read, and was developed into a series by Kevin Williamson, who also created the Creek series and wrote the first two Scream movies. His trademark is well-written peppy dialogue with a lot of wordplay and pop culture references. The episodes he writes himself do indeed feature that, though the average script for the series is noticeably less sharp. Core of the series are Damon and Stefan Salvatore, brothers who were both turned into vampires in 1864 by the evil vixen Katherine, who happens to be the spitting image of Elena, a girl the siblings both meet and fall for in current day. There’s an explanation for Elena and Katherine looking the same, but let’s just say it’s complicated. (And let’s overlook the fact that the age difference between the Salvatores and their love interest is pretty damn creepy when you think about it.) This all happens in Mystic Falls, a town where the brothers own a mansion in which they lurk around moodily, from the first episode of the series onwards. 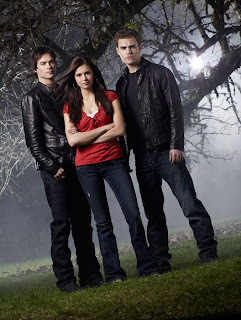 There is a love triangle between the brothers and Elena, of course, and there is a lot of angst and romantic entanglement among the whole teenage (but really in their twenties) cast. At first the vampires seem to be the only ones out of whack in a fairly normal world, but soon there are witches, vampire hunters and rings that revive you if you die. Werewolves are also likely to put in a first appearance soon. The series has two main narrative problems: the stakes seem low even when they are high (accidental pun there) and the series hasn’t figured out how to keep its main, popular bad guy around in a way that’s believable. To start with the first problem: those back-from-the-dead rings are a lazy narrative cheat, not to mention a somewhat silly one. In a recent episode, it was suggested that the reviving would only work if something or someone supernatural was involved in the wearer’s demise. So a vampire could twist your head around and you’d die for a bit and ultimately end up just fine, but if you’d trip and hit your head on a coffee table, you’d be toast. Apparently. A couple of times already, the writers have made a spectacle out of killing a main or regular character only to have them – ta-daa! – sit up with a jolt a couple of scenes later, none the worse for wear. That really takes the edge off the threat of mortality. Admittedly, some deaths in the series did take and some people stayed in the afterlife, but watching a death scene with the initial thought ‘Meh, maybe it won’t stick anyway.’ dulls the dramatic impact. Call it the ‘Comic Book Superhero Revolving Door of Death Syndrome’, as also seen on Heroes, where it was part of the decline of the series. The origin of these magic plot-device rings has not been revealed yet, but then the same goes for the rings the Salvatores wear to be able to walk around in daylight, thankfully not glittering Twilight-style as they do so. I wonder if an enigmatic mystic jeweler will soon be putting in an appearance. The second problem is Damon (Ian Somerhalder), the cool, morally ambiguous and funny ‘bad’ Salvatore brother who gets all the best lines. There’s no doubt he is the most entertaining character and it’s clear he should be kept in the series, but he has done some fairly unforgivable things and been forgiven nonetheless. When one of the leads just mopes around for a couple of episodes when Damon kills (or at least tries to) one of their friends or relatives, you start to wonder why you as a viewer should care, since even the people on screen don’t seem to mind that much. The cast in general seems a bit too blasé about innocent bystanders falling by the wayside at least partly because of their own actions and the emotional impact of a life lost, doesn’t last much beyond a single episode. The good guys come off as irresponsible for letting a loose cannon like Damon run around and even go so far as to hang out with him in a semi-friendly way. The writers are pushing him out of the ‘bad’ zone and into a moral grey area lately, to make his prolonged presence believable, but he still takes the occasional detour across the ‘evil’ threshold. To make him too good would ruin the character, but somehow he needs to be forced into being a relatively good boy for the long term, against his more evil nature. Hey, it worked for Spike from Buffy: The Vampire Slayer, even if it took first sticking a chip into his brain that prevented him from hurting humans and then giving him his soul back. For The Vampire Diaries a witches’ curse might do the trick, as I think in this series vampires still have their soul. Hopefully The Vampire Diaries will find a proper place for Damon and do away with cheap gimmicks that deflate the tension. The series is unlikely to stick in the mind after it’s all done and dusted years from now, but it makes for entertaining, if highly disposable, viewing.